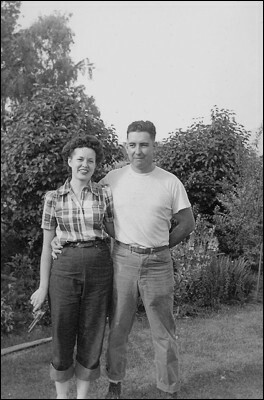 This is Mom (Fredene) and Dad (Shirrel) in Medford, Oregon in June, 1948. It's an interesting photo. Dad (with his signature smirk) is in his "At Ease" Marine pose with one arm around my mother, his eyes focused her way. Mom is looking into the camera with one arm around Dad, and holding a pistol. Though there were a few deer hunting rifles locked up in the garage as I grew up, I never once saw a pistol. It's a mystery why it's in the photo, and even more mysterious that my mother is holding it.